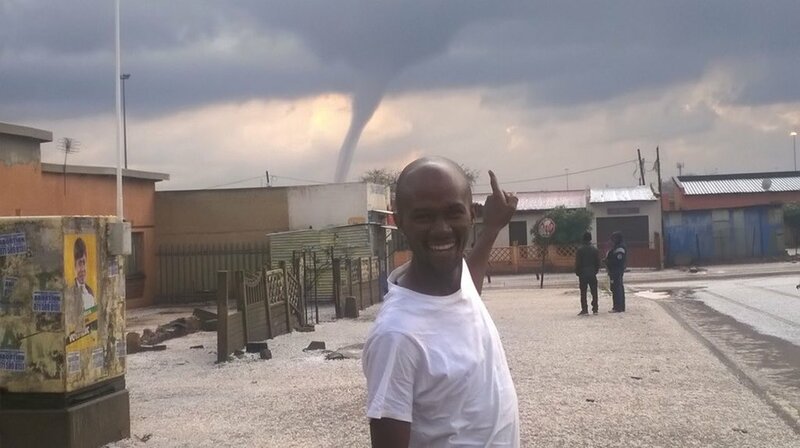 This image, shared widely on social media, of a man pointing at the tornado in the distance, has already become iconic. The icy weather that has gripped vast swathes of the country over the last few days is extraordinary.Â From flooded CBD streets and severely damaged informal settlements in Durban, to snow-capped peaks in the Drakensberg and now, a tornado in Johannesburg, South Africans find themselves talking about the weather with great gusto. And from the noise on social media you would think tornadoes are a very rare occurrence in the country. In reality, while rare, tornadoes are not exceptional. While it is difficult to estimate with any degree of accuracy how many tornadoes have been experienced in the country,Â they are said to usually occur in Gauteng, the Free State, KwaZulu-Natal, Eastern Cape. A tornado hit Harrismith and turned 750 homes to rubble. Eleven people were killed when a tornado Umtata in the Eastern Cape. Former President Nelson Mandela was in the town at the time, in fact, inside a pharmacy when the tornado hit.Â He was reportedly told to hit the ground when the tornado hit. A violent tornado ripped through towns around Mount Ayliff in the Eastern Cape. Some 25 people were killed. 500 others injured. According to some reports, 95% of people in the area lost their homes. Some experts say that as many as three tornados may have hit the region between 1998/9. A tornado ripped throughÂ Surrey Estate, Manenberg and Gugulethu in Cape Town, killing five people, including a baby, leaving 5,000 homeless and injuring more than 180 people. This one here was a special storm, Â as no one actually saw the twister itself. According to IOL,Â Cape Town weather office forecaster Steve Medcalf said that although nobody saw a column of spinning air at the time the damage was caused, “in retrospect all signs show it probably was a tornado”. Two tornados ripped through Duduza on Gauteng’s East Rand and Ficksburg in the Free State. One child died and hundreds of others were injured.